Lily Lemontree has a lot of baggage...and unfortunately she drags it around with her wherever she goes! Not having left the house in ages without at least one tote or bag stuffed to the gills with everything it takes for Lily to be, well Lily, I have dreams of strutting around town on a daily basis with one of these simple, pared down pouches that have touched down this season. It will take a good look at what is consider necessity and what you can do without in your day to day. I will be the first to admit that I had convinced myself that all the junk I shoved into my purses and totes were absolute musts but after taking a few moments to let go of the majority of the bulk, I found myself walking a little lighter with a few key pieces in a sleek leather envelope and yes, I made it through the day without a 'major crisis'. Now, there will be days when this pared down existence will be impossible (no matter how hard I tried, I just couldn't squeeze my laptop into my clutch! ), 'shedding the bulk' is something I definitely plan to do more often this summer. 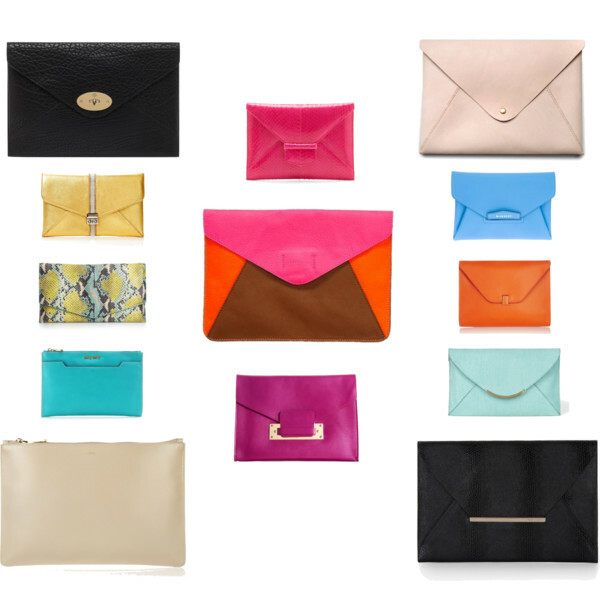 'Minimalism' is the word of the day for summer 2013 and that word so happens to be the middle name of the envelope clutch! Last night I finally picked up a petite Steven Alan bag I've had my eye on–small enough that I won't be tempted to carry the wallet, two notebooks, Kindle, tech kit, lip balm bag...I can obviously live without! I didn't think I could do it with anything less than what I had always lugged around but I have been feeling a new freedom since my purge...and I think I have figured out why my shoulders are always killing me by the end of the day! I always keep mine very close, I am worried about that too sometimes! I love the look of a clutch but have way too much baggage myself...I could use a tutorial on how to leave home with less! I feel as light as a feather this week! Love this style clutch. I have a large black envelope clutch that belonged to my mum and I love to use it. I like the way clutches are being used much more for day wear and not just evenings.